Topics in this edition of the PHR Mailbag include Tampa Bay’s dominance, Phil Housley’s future in Buffalo, the Adam Fox situation, the upcoming draft, Boston’s injury replacement, the Rangers, and teams that could be primed to shake things up with an early postseason exit. sovietcanuckistanian: Does anybody in the East have a legit shot at beating the buzz saw that seems to be Tampa? I know it’s the playoffs/anything can happen and the track record of Presidents’ Trophy winners winning it all is spotty, but it’s hard to want to bet against them given everyone else in the East (or West it would seem). Thanks in advance. I certainly wouldn’t want to bet against the Lightning but I could see Boston and Toronto legitimately having a shot from their own division. The Bruins are a playoff-tested team and their top line is certainly a dominant one. They’re also getting strong goaltending that’s capable of stealing a game or two. With a decent back end, that will give them a chance. If Toronto gets through that opening series, they certainly have the offensive firepower and depth to match up well. Like Tampa, they’re also a pretty quick team. Their defense concerns me but it’d be tough to rule the Maple Leafs out of a high-scoring series. From the Metropolitan Division, Washington beat them last year and the core is largely the same this time around. If they did it once, they could do it twice. Considering how dominant Tampa Bay has been this season, they are more than deservedly the favorites no matter which matchups they wind up with. That said, it’s far from a given that they make it through as there are a few teams that are capable of giving them a tough series at the very least. 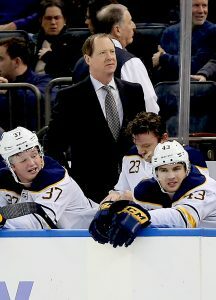 ThePriceWasRight: Do you think between a poor 1st season and collapse in the 2nd half this season that Housley is shown the door? I think it’s a lot more of an option now than it was a month ago given how awful they’ve been but I think Buffalo may be inclined to give him one more look for next season. It has been a bit of a revolving door behind the bench in recent years and at some point, they have to show a bit of patience, don’t they? Despite their poor play as of late, there have been some positives this season for sure, especially up front. Jack Eichel and Sam Reinhart are having career years while Jeff Skinner was one of the elite scorers for most of the season before tailing off as of late. Rasmus Dahlin has developed nicely in his rookie year as well. Several core young players developing and showing improvement has to work in his favor. Yes, they’ve had some difficulty keeping the puck out of their own net but part of the blame for that has to lie with GM Jason Botterill. Their goalie tandem had all sorts of question marks coming into the season and they still do while their back end isn’t the deepest either. That’s not to absolve Housley entirely but it’s not all on him either. If it was up to me, I’d give him another look next season with what should be a bolstered group as they have plenty of cap space to work with this summer. However, if they start slow in 2019-20, then the time will be right to make a change. mikedickinson: Adam Fox is reported to be going back to Harvard for his senior year. He was the key to the Calgary/Carolina deal from the Canes side. Yes, we are deep on defense, but you can’t just lose a young stud like that. Think the Canes will try to sign him as a free agent? If he makes it to free agency in August of 2020, they’d surely try to sign him. Why wouldn’t they? Nashville went after Jimmy Vesey even after he made it clear that he was testing the market and Carolina would certainly do the same in this situation. To me, the bigger question is whether or not he’d be property of the Hurricanes by the time we get to that point. If he indicates to the team in the coming days (or even months) that he’s going to play it out and go to the open market, I could see Carolina trying to move his rights for a conditional draft pick. If there are certain teams he’s amenable to signing with, dealing him this summer and getting something for him (or at least getting the potential to get something) may be the right move for them. tigers22: After Hughes and Kakko who are the next best prospects? How many goalie prospects could be drafted in the first round? Lethbridge center Dylan Cozens has been a near-lock to be a top-five pick since before the season started. He took a big jump forward offensively this season and is a strong skater for his size. Russian winger Vasili Podkolzin could be a top-line winger and has moved up to the number three spot in many rankings. However, there are some questions as to his willingness to cross the pond which could hurt his stock a little bit. While he won’t go with this group, winger Cole Caufield has a whopping 52 goals in 54 games with the US NTDP. His lack of size will cause him to fall but in terms of raw offensive upside, he’s among the best in this draft class. Connorsoxfan: Is Kuhlman an adequate replacement for Kuraly? I saw he scored the other night after picking off a pass but that’s the only clip I’ve seen of him so far. Should I be worried about that line against Toronto come playoff time? While losing Sean Kuraly hurts, Karson Kuhlman should be a capable replacement if he is indeed in for the first round. The Maple Leafs are a team that has a fair bit of firepower in their bottom six group so having another skilled forward like Kuhlman in wouldn’t necessarily be a bad thing. The bigger concern is not having Kuraly’s penalty killing ability against a Toronto power play that can be quite dominant when it gets going. They’ve deployed Kuhlman in a limited PK role in the games he has played but Kuraly is the better fit in that role. However, it could all be moot as with Marcus Johansson back in the lineup, there really isn’t a regular spot for Kuhlman at the moment. If they do need to call on him against Toronto though, I think he’s a better fit against them than he would be against some other opponents. acarneglia: Are the Rangers a few big signings away in FA from being contenders again? By big signings, I mean Karlsson and Panarin. Well, any team that lands both Erik Karlsson and Artemi Panarin in free agency would likely be considered as contenders, at least to some degree. I have a hard time thinking that the Rangers (or anyone) could get both of them and even if they did, I don’t think they’d really get back into contention right away. With the youth movement the team is currently on, they will be counting on their young players to play big roles in the near future. Adding over $20MM in financial commitments in this scenario would only up the pressure as they’d have to move out some of their mid-tier players to afford those two. Are players like Filip Chytil and Lias Andersson ready to be impact forwards? Can Anthony Deangelo and Libor Hajek be full-timers on the back end and be more than third pairing players? If the answer isn’t yes, they’re probably not ready to be true contenders and contend with the likes of Tampa Bay, even with two star additions like that. pitmanrich: How do you rate the jobs David Quinn and Gorton have done for the Rangers? Is Quinn good enough to be an NHL coach? And Gorton gets a lot of bad press off Ranger fans but most of his trades and signings aren’t hurting the team either now or in future like previous GM’s did. I was not a big fan of the David Quinn hiring when it happened. I thought they should have looked at someone with a bit more success at developing professional players rather than looking to the college route. That said, I think he has done a decent job this season. The Rangers are far from an elite team on paper and they’ve been competitive most nights. I’m a little concerned that players like Chytil and Andersson aren’t making more of an impact but they’ve shown some improvement at the very least. Is he their long-term coach? I’m not sure I’d go that far but he’s had a decent rookie season behind the bench. As for GM Jeff Gorton, he has made good moves for the most part. They’ve received decent returns in their selling moves which has helped restock and provide some depth to their group of prospects. That’s a good first step but he will largely be judged by the moves he makes (or fails to make) to bring them out of the rebuild with an eye on contending for a playoff spot and more. As we’ve seen with several other teams over the years, it’s easy to try to start a rebuild but tougher to build your way out of it. That will ultimately define his tenure but so far, I think he’s done pretty well. ThePriceWasRight: Which team who struggles in the playoffs could you see making major changes this offseason (outside of Columbus obviously? I don’t think there will be too many playoff-bound teams that will really shake things up dramatically. Toronto will look a bit different simply based on their cap situation but they shouldn’t have many major moves. Same with Tampa Bay. Those won’t be dictated by their success (or lack thereof) in the postseason. Of those that could do something based on an early exit, I could see Pittsburgh being a team if they’re ousted quickly. They haven’t been firing on all cylinders much at all this season so a quick elimination could be enough to make GM Jim Rutherford decide to change up his core. Phil Kessel has been in trade speculation for two years now. Perhaps going out quickly changes that. Out West, Dallas is going to have some money to spend this summer so they could look a bit different but that’s going to be the case regardless of how they fare in the postseason. San Jose may lose a key piece for cap reasons as well. But in terms of a team out there that could make major changes with an early loss, I’ll pick Nashville. David Poile hasn’t hesitated to significantly shake up his core over the past few years and I wouldn’t put it past him to make another major move or two, especially if they go out in the first couple of rounds. I think the Lightning will win the Cup but among the teams capable of beating them, Toronto is definitely not one. Their shoddy defense and desire to play wide open hockey plays right into Tampa’s hands. A Tampa-Toronto series would be over in 5 games. Boston and Washington are the only Eastern teams that concern me. No way I would bring Housley back.